Pernicious Amnesia- that’s what my favorite seminary professor called it – we have a case of pernicious amnesia. Verse 10 of John 1 says, He was in the world, and the world came into being through him; yet the world did not know him. The world did not know the Word. Pernicious amnesia - how can we forget where we came from? How do we forget we came from God, forget who we are and whose we are? We love the story of the self-made man or woman, the rugged individualism of our culture, the pull yourself up from your boostraps, mentality as if any person came into being of their own free will and grew up without the intimate participation of dozens, if not hundreds of other people. The new year is a time of special amnesia—we put on our Nike trainers, we have our Starbucks in hand, and we’ve got our apps to track our fitness, our to do lists, our sleep, our job, our schedules, our kids and commitments - we’ve got the world by the tail and we’re going to whip 2016 into shape. Well, we may work hard, and that can be a wonderful thing and result in great outcomes, but none of us came into the world and got to today by the sheer force our will. • We did not participate in the creation of the environment in which we will live—the oxygen that keeps us alive, the soil beneath our feet, the trees that shade us or the miracle of how a tiny seed becomes the wheat or the fruit we eat. It’s so easy to forget these basic truths about our very existence. I can pray in the morning and by lunch I’ve forgotten that my life is created and rooted in a power much, much greater than myself. Instead I’m trying to hold the earth on it’s axis while managing, mothering, manipulating everyone else’s life and work, believing it’s all up to me (no wonder I have migraines!). That’s why it’s pernicious amnesia—because even after I remember that I came from God and will return to God and God’s in the midst everything and every moment, I forget again, many times a day, no less, and believe all of life is up to me. Just plain self-forgetfulness is the greatest of graces. The true relationship between the soul and God is the perfectly simple one of a childlike dependence. Well then, be simple and dependent: acknowledge once for all the plain fact that you have nothing of your own. It’s so easy for me to forget that I have nothing of my own. But God sees our amnesia and decided to enter our world to help us remember who we are and where we came from. So God came like a child—God came in childlike dependence to demonstrate the fundamental truth that God our Source, our Sustainer and End. God sent Godself to us to cure us of our pernicious amnesia- to help us re-member. To remember literally means “to put back together." God sent Godself to put back together our primary relationship with God who exists since the beginning of time. This cosmic God who is the Source and Sustainer of the universe - where there are – 200 billion stars in our solar system! Our solar system lives in a universe of galaxies; there are 100 billion galaxies in the universe! This God of 100 billion galaxies pressed Godself into human DNA, into the size of a tiny embryo and into a female uterus, which is size of a man’s fist! (I first learned this phrase from Sr. Carla Mae Streeter, a theology professor emeritus at Aquinas Institute). God clothed himself in flesh and blood and limitation and emotion and finiteness. God put on the limits of flesh and bone. The light that was God’s first creation - this light comes to us, dressed in human skin. What do we make of this kind of God? God will go to any length to make sure that you and I know that we are born of God, loved by God and that nothing delights God more than being with us, living in us, dwelling in our humanity and daily life. God will spare no expense and no effort to communicate love to us. God will stop at nothing so that we know God’s love us and gives power to become children of God, born of the will of God (not of will of flesh or world) and we receive grace upon grace. God came in human form so as to say “don’t’ forget!” Remember who you came from, remember who you are as my child, remember who loves you into being. The One who was In the Beginning created your beginning. This is why we have worship every 7 days- because we forget who are. So in the beginning of the week, we remember and put back together who we are. It’s why daily prayer matters because it helps cure us of our amnesia: so that in the beginning of the day,in the beginning of a meal, in the beginning of our nights' rest, we acknowledge the Source of our life and pull ourselves back from forgetfulness. Short Daily prayers ground us in God’s love and presence - that because Jesus took on our humanity, Jesus is clothed in your humanity, in your life and work, in your relationships and actions and daily breath. The Creator of the universe has given birth to you and wraps you in love and power, in light and truth. When we remember who we are, when we remember how we came into being, when we remember the Creator dwells with us and in us, then the world is a completely new place. Since the Word and Light and Presence of God took on the double helix of our make-up and embraced the whole human experience, we are given the gift of seeing the sacred presence of God in our daily life, our daily world—in the creation and in the people God has created and called into being. That’s what God-sightings are about – seeing Jesus with some skin on. PrThe psence of God, or what the bible calls the “glory” of God is hidden inside each person. Since God arrives in a stable with the beasts, then surely God is in the flooded houses, and with the people who lost their business in our recent flooding. We see Jesus with some skin on in those who are filling sandbags and donating blood and new furnishings, those who help the re-building and donate money. Those who bring hope and light and a way to start again. 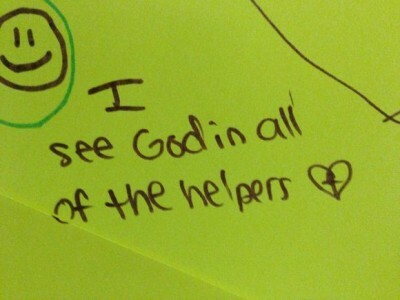 A colleague shared with me that the way she tells children to see God in the midst of a crisis is to, "look for the helpers." The helpers are the ones who are Jesus with some skin on—where divine energy and light are breaking through in the world. When we remember who we are and where we come from and see God at work in the world, then we can join John the Baptist in this Gospel reading and testify to the light. When others forget, when they suffer from amnesia, when all they can see is loss and hurt and heartache, we can say, "see the light here and the light there: God is in the unexpected smile, the shoulder to cry on, the meal prepared and brought to your door, the friend who takes you to the doctor, the neighbors who leave their tasks and help you clean up and rebuild, the prayers offered, the love and encouragement shared." God is here and wrapped in the ordinary stuff of our daily life. When I was in chemotherapy for breast cancer, I was just plastered to the bed with exhaustion. After one treatment, a friend came over sat on the bed with me while I rested. She would knit, and I would doze off. I would wake up and there she would be knitting. We would chat for a minute, and then I'd doze off again. I'd wake up and she would be there, knitting. I had forgotten that God was in this terrible, desolate pit with me. But this friend became for me, Jesus with skin on and knitting, helping me to re-member that I was not alone. Several years later, when I have a amnesia now, I remember how it felt to wake up and see her next to me, knitting, and it helps me remember. Earth is crammed with heaven, the very presence of God in every cell, every plant, every person. And the Word became flesh and lived among us, and we have seen his glory, the glory as of a father's only son, full of grace and truth. So, re-member, remember you are born of the will of God so you can see this ordinary life crammed full of the light and presence of the Word made flesh—that’s a new year goal worth embracing.